Thank you for adopting/fostering a dog in need, without your help, the future of these dogs in our world would be uncertain. We are grateful for your understanding that 'no dog is perfect' and your commitment to rescuing a dog in need. Many of you have already owned German Shepherds, however, please take a moment to read the guidance provided as we feel that it may further enrich your experience and knowledge which will benefit both you and your new companion. Safety is a priority. Please take a body harness and a slip lead when you collect your new dog. Do spend a little time with him prior to the car journey so he may familiarise himself with you. You may want to give him a delicious treat with 4 drops of Rescue Remedy ( available in most pharmacies) and take him for a short walk. This will help calm him before your journey home can begin. Rescue Remedy can be administered in many stressful circumstances and is a useful product to have in your cupboard. Please make sure the dog is safe and comfortable in the car, in a crate or in the boot with a dog guard. Leave the lead and harness on so you have something to hold onto when you arrive back home to take him out of the car and into your home. A second pair of hands is always useful so try to enlist help from a family member who can accompany you on the trip. Prepare your home beforehand. Do make sure all escape routes are secure. Put the dogs' bed where you would like it. Shut all the rooms off where you would not like to dog to have access to. In the first few days, it should ideally be members of your household who have contact with the dog so he can adjust. In a few days, once the dog is settled, you can slowly start having friends and family over as normal. Let him explore his new surroundings in his own time, do not force the dog to go into a space he is uncomfortable with. Initially, you may wish to keep the lead on him, but drop it so it drags while the dog explores at his own pace. Fill up his bowl of water and show the dog where it is. Show him where his bed is and encourage him to use it. Some dogs do not even know what a bed is, having lived outside or on a concrete floor, so give the dog time to adjust. As a whole, it is important that the dog has many positive experiences in his new found home. These new experiences along with appropriate training will accelerate his learning and he will be more likely to 'leave past experiences behind' and learn new ones. Feed the best food that you can get or prepare yourself. Dogs fed on cheap commercial diets, even ones prescribed by some vets can have a negative impact on the dogs' wellbeing. Dogs should ideally be fed twice a day. Poor food choices can cause behavioural problems in dogs and you are encouraged to research the huge variety of options available to you and also discuss this on our Facebook page. Your dog may be feeling the effects of stress the first few days, so his appetite may not be optimal. If he is not eating normally after a week or so, book a check up with a vet. 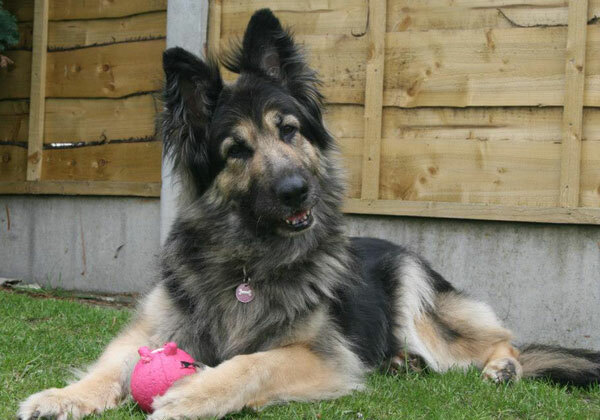 Please also see our reading recommendations on feeding at the bottom of the page and the Healthy Feeding and Natural Health section on the GSDR website. Dogs are social animals by evolution, so confinement alone for long periods can have a negative impact on their health. Safe sleeping areas, the company of other dogs and humans with positive interactions can greatly improve the quality of life for most dogs. The average dog will sleep 10-12 hours a day, although not in one stretch. Older or unwell dogs may sleep a little more. It is important to understand that suddenly expecting a dog to sleep in a crate ( when it has had no previous positive association ) is unfair and compromises the dog's safety as he perceives it. If you would like to use a crate then it is important to slowly habituate the dog to this using positive reinforcement training. 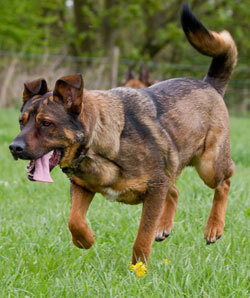 Exercise, both mental and physical is important factors in a dog's health. Off lead play ( where appropriate and safe) and same species play, along with lead walking will add to the variety of the types of exercise the dog gets. Many dogs enjoy water play and this could also be enriching if you have a lake, beach or a dog pool near you. There are also many mental stimulation games and interactive toys available on the market. These can go a long way to prevent boredom and behavioural issues that arise from not having much to do. An unprecedented amount of dogs is coming into rescue centres these days, mostly for behavioural problems. German Shepherd dogs are a strong but sensitive breed, which is all the more reason to approach training with knowledge, compassion and kindness, but most of all, ethics. Putting time and effort into training humanely will ensure you have a greater bond with your dog which will last forever. Many behaviours that are normal to dogs are seen as problem behaviours in a domestic setting. Even now, many people still think that the human has to be the 'pack leader' at all times in order to bring the dog under control by its associated methods. 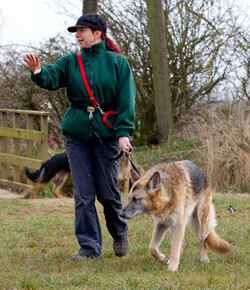 eg: dominance reduction training, use of shock, spray collars, check chains, alpha rolls, withholding food etc. These outdated training methods are deeply rooted in force and in many cases only serve to suppress the undesired behaviour, which can ultimately have disastrous consequences for both dog and human. For example, there is simply no need for the human to assert himself as the 'pack leader', this is a dangerous and stressful position to ask someone to put themselves in, one in which most humans eventually fail. There is also no scientific basis on why the dog should eat after the humans have eaten. These are just baseless 'rules' that were made up a long time ago to try and make the human feel in control of their dogs. To give you some history, these old methods were formed from the study of the behaviour of wolves in captivity. This as we now know, was a highly unnatural environment as wolves in captivity had to compete by fighting for position, due to a shortage of resources such as space, food and potential mates. These old studies have no applied basis of insight into a dog's mind. In more recent years, we have seen studies that are based on wolves in their natural habitat. Combining this new research and our knowledge of the evolution of the domestic dog with the wolf being the predecessor, behaviourists and trainers have made modern dog training much more ethical and humane, not to mention more enjoyable for both dog and human! As you will be aware, many rescue dogs come with a certain amount of 'baggage', and in many cases, their previous experiences may have been of a negative kind. It is our role as their humans to help them achieve happiness and stability. This can take time, patience and commitment. Many behaviours in dogs such as barking excessively, jumping up, digging can easily be solved by simple techniques using positive reinforcement. However, the more serious issues such as lead aggression, dog on dog aggression, territorial aggression and resource guarding need a more thoughtful approach, as these behaviours are based on fear. A good behaviourist will be able to help you overcome these issues without the use of force. If you feel that your dog is displaying behaviours you do not understand, or behaviours that are causing problems, we urge to take a look at the links provided at the bottom of the page. Here you will find links to various websites where you will be able to find a qualified force free trainer or behaviourist in your area. We also have a list of excellent books to guide you in helping your dogs and achieving success in training. It is not recommended that adopters dealing with aggression cases take the dog to training classes without first seeking advice from a force-free based, qualified behaviourist. 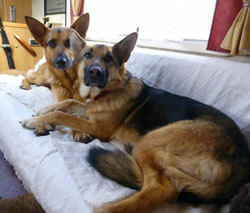 Here at GSDR we are all committed to helping you with the successful and happy rehoming of all our dogs. Each dog is unique and comes with his own set of experiences. Please get in touch with us if you need help or advice. Below you will find a simple list of useful books which will enhance your knowledge of dog behaviour and health. This poor dog spent over 2 years in kennels because he wasn't perfect. 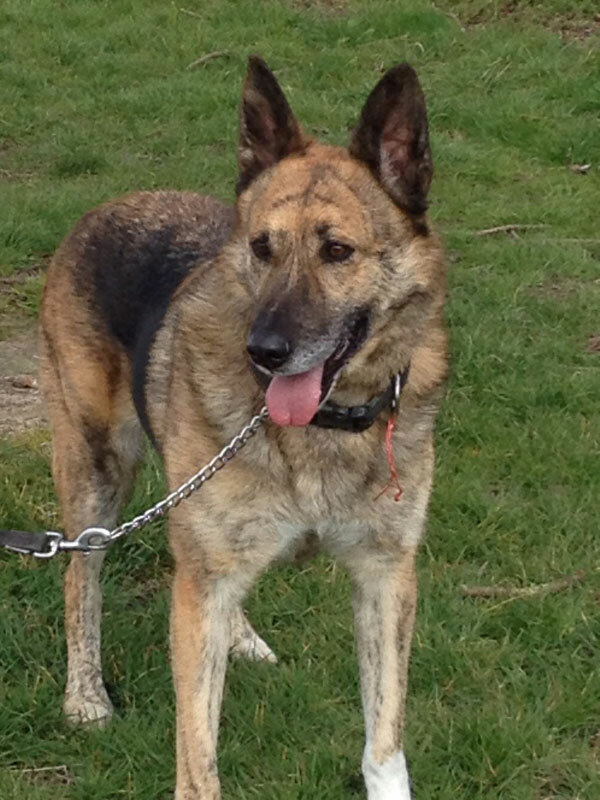 Benji was a bit shy with new people initially but never aggressive and he loves other dogs. He is a classic example of a dog overlooked because he is not perfect yet his problems would easily be overcome by a kind patient owner, willing to help Benji overcome his fear of humans. Benji was lucky and finally found that patient understanding owner and has flourished. 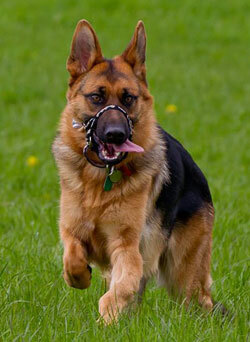 He is a star on GSDR walks now, a firm favourite with everyone he meets.